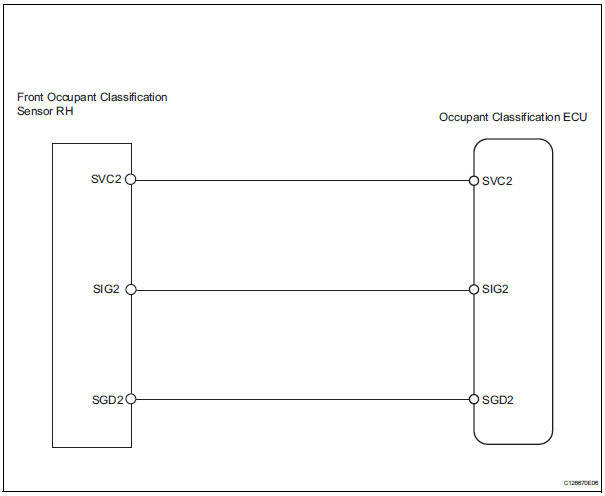 The front occupant classification sensor rh circuit consists of the occupant classification ecu and the front occupant classification sensor rh. If troubleshooting (wire harness inspection) is difficult to perform, remove the front passenger seat installation bolts to see the undersurface of the seat cushion. In the above case, hold the seat so that it does not tip over. Holding the seat for a long period of time may cause a problem, such as seat rail deformation. Hold the seat up only for as long as necessary. Ok: dtc b1781 is not output. Dtcs other than dtc b1781 may be output at this time, but they are not related to this check. Check that the connectors are properly connected to the occupant classification ecu and the front occupant classification sensor rh. Disconnect the connectors from the occupant classification ecu and the front occupant classification sensor rh. 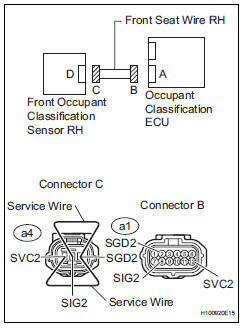 Using a service wire, connect terminals a4-1 (svc2) and a4-3 (sgd2), and connect terminals a4-2 (sig2) and a4- 3 (sgd2) of connector c.
Do not forcibly insert a service wire into the terminals of the connector when connecting them. 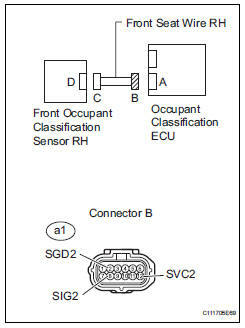 Connect the connectors to the occupant classification ecu and the front occupant classification sensor rh. First clear dtcs stored in the occupant classification ecu and then in the center airbag sensor assembly.